Grand Luminary or Great Star flags of the Civil War era are the pinnacle of American flag making design in the 19th century. They are spectacular statements of unity and embody the sentiment of our national motto, e pluribus unum... Out of Many, One. This particular example has several characteristics that make it distinct from others of the type. It features a striking large center star with its tips aligned to the inside corners of the large great star. The great star is made of smaller stars aligned along the same axis, showing great precision, planning and uniformity. The arms of the great star do not cross in the center, which accentuates the form of the star itself. 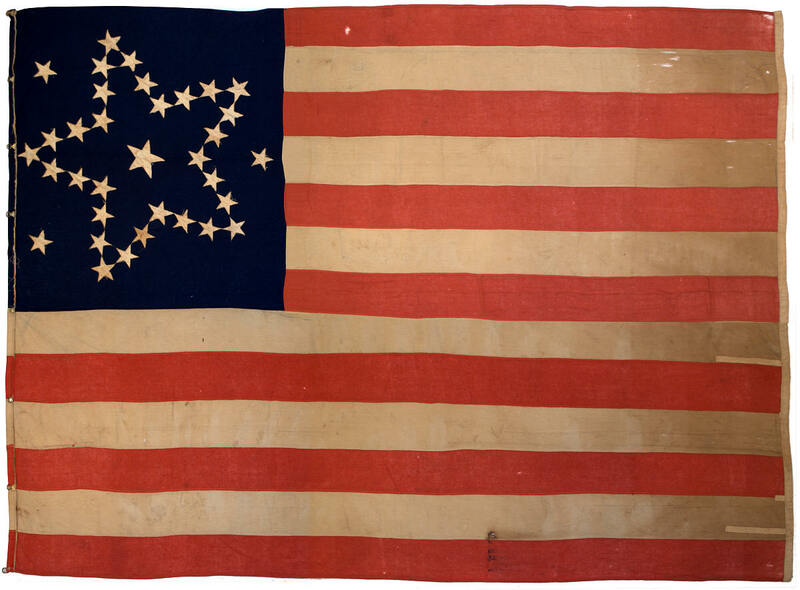 Though its tempting to think that the star was originally 31 stars, and the three outlier stars were added later, close examination shows that the construction and materials of the outliers match the other stars in the flag, and were added at the time when the flag was made, circa 1861-1864 during the opening years of the American Civil War. The flag is machine stitched with a treadle machine, to include the stitching of the stars. The materials of the flag are very fine quality, with the blue canton fabric consisting of a heavy weaved wool, similar to a blanket wool. This is something typically seen on homemade flags of the era. It's difficult to say whether or not the flag is, in fact, a homemade flag. Its materials are more indicative of a homemade example, but the precision and quality of the handiwork is indicative of a cottage industry manufactured flag. The flag is a beautiful survivor from the early years of the Civil War, and a majestic example of one of the most highly sought after styles of antique American flags, the Grand Luminary flag.